Women can experience stress with anything from family, relationships or budding financial issues. However women living HIV can have the same stress but may experience greater difficulty coping with stressors. 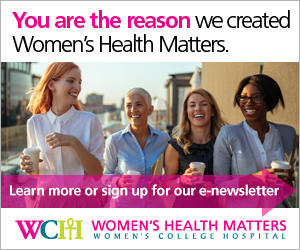 For National Aboriginal Awareness Day, Women’s Health Matters spoke to Dr. Anita Benoit of the Women’s College Research Institute about her research, which focuses on social indicators of stress among Aboriginal women living with HIV. Dr. Anita Benoit’s research project entitled Linking social and basic sciences to understand stress as a social indicator for the lived experiences of Aboriginal women and a biological indicator for the physiological impact of stress on HIV pathogenesis, aims to understand the types of stress that affects women who are HIV positive and the ideal approach to manage stress for healthier outcomes. Dr. Benoit notes that according to the Public Health Agency of Canada, Aboriginal women living in Canada are disproportionately affected by HIV. Managing stress levels for Aboriginal women living with HIV, and women at risk for HIV exposure, is an important determinant of health, given that high stress levels have been shown to have a negative impact on psychological well-being as well as immunity. Through her research, Dr. Benoit seeks to uncover how women can apply a stress-reducing therapeutic intervention for a healthier outcome. Dr. Benoit’s research project focuses on characterizing stress, discussing different ways to manage stress and measuring stress levels through stress biomarkers. An integral component of research with Aboriginal people is respecting Aboriginal cultures and values and following Aboriginal-directed research methodologies. Dr. Benoit explains that part of her research will be to try to characterize stress through focus groups and determine which form of stress management is more effective, whether it be conventional methods, spiritual healing or a combination of both. Benoit will be looking to measure stress levels through participant’s saliva, which contains stress biomarkers, and hopes to measure these stress biomarkers in women before and after practicing an intervention. Dr. Benoit stresses the importance of integrating women living with HIV in all phases of the study in order to design the study based on their concerns. “What’s unique about this project is that it’s approaching the issue of stress from both a biological and social perspective,” says Dr. Benoit.